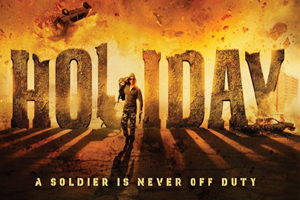 Holiday: A Soldier Is Never Off Duty is a 2014 Hindi action thriller film written and directed by A. R. Murugadoss, and produced by Vipul Shah. It features Akshay Kumar and Sonakshi Sinha in the lead roles, along with Govinda, Freddy Daruwala and Sumeet Raghavan in supporting roles. The soundtrack of the film is composed by Pritam Chakraborty, Kaushik Dutta, while lyrics were penned by Sukumar Dutta, Irshad Kamil. Here is the link of all the songs lyrics and videos of Holiday.